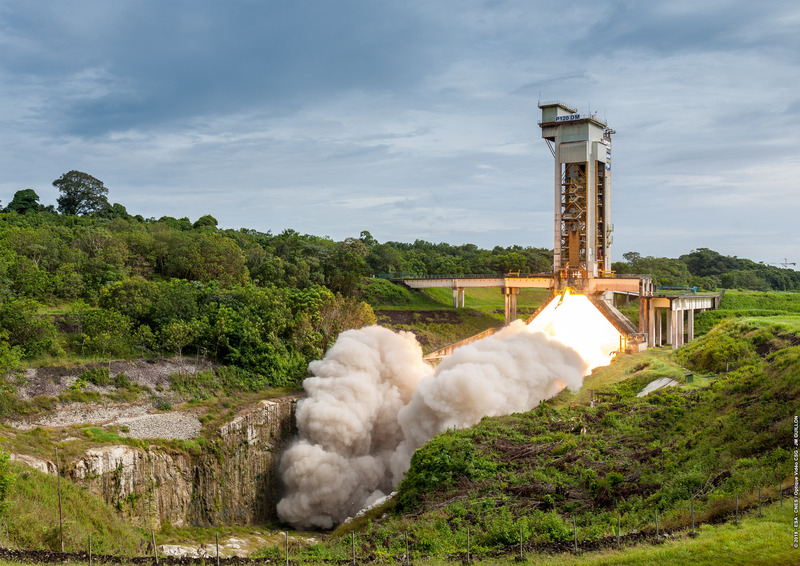 A crucial milestone in the development of the future Ariane 6 and Vega-C launch vehicles was reached Monday 16 July with the first test of their common P120C engine on CNES’s BEAP solid booster test stand at the Guiana Space Centre. First test of the P120C booster common to the future Ariane 6 and Vega-C launchers on Monday 16 July on CNES’s BEAP solid booster test stand at the Guiana Space Centre. Credits: ESA/CNES/Optique Vidéo CSG/JM.Guillon, 2018. The test was designed to validate the booster’s design, fabrication and performance, as well as its overall behaviour and components. The hot-fire test lasted 135 seconds. Two more such tests are planned to qualify the engine before the maiden flights of Vega-C in 2019 and Ariane 6 in 2020. A filament-wound casing manufactured by Avio using automatic lay-up of carbon/epoxy prepregs. A nozzle manufactured by ArianeGroup from several composite materials, including carbon/carbon, capable of expelling the extremely hot gases (3,000°C) generated by the booster at very high speed to turn the energy from the combustion gases into thrust. This nozzle can also be gimballed for thrust vectoring. The propellant is cast and final booster integration completed in French Guiana. Developed jointly by ArianeGroup and Avio for their joint venture Europropulsion, the P120C is the largest monolithic carbon-fibre solid-rocket booster in the world. The Ariane 6 and Vega-C development programme was decided at the ESA Ministerial Council meeting in 2014.